The Shrewsbury and Telford Hospital NHS Trust and the Princess Royal Hospital in Telford were focused on improving patient access to services. This was particularly challenging for upper limb orthopaedics and dental surgery. As the provider of acute care to 500,000 people, the site had an essential need to assure efficient patient flow. The hospital wanted a solution to that would do more than increase capacity for patient treatment. They also wanted it to provide ample room for patients’ recovery. Vanguard Healthcare Solutions met with the hospital’s clinical, estates and management teams. Together, they developed a plan to use a visiting hospital facility. 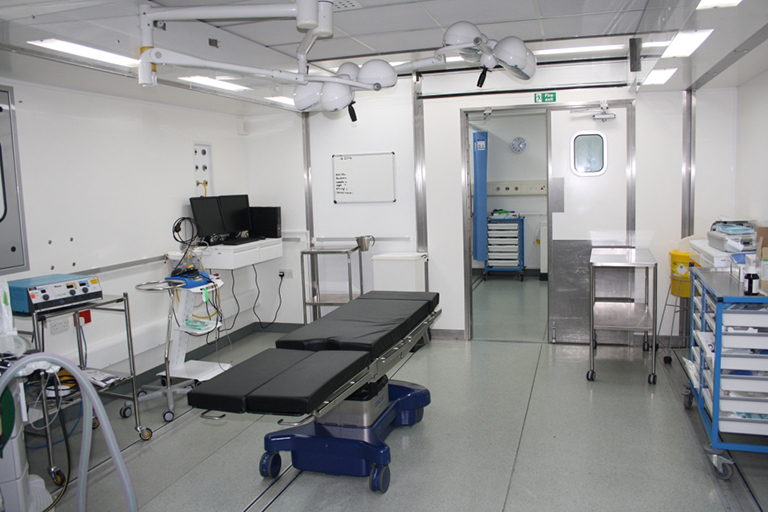 This would maximise the efficiency of the unit through a combination of mobile theatre and mobile ward, allowing the facility to act as a standalone day surgery. The visiting hospital offered dedicated anaesthetic, operating and recovery rooms. It also used a laminar flow system in the operating theatre, reducing the risk of infection and ensuring the facility was suited to the invasive orthopaedic procedures which the hospital required. Vanguard additionally supplied two nursing staff members. This reduced the impact on the hospital’s own nurses and provided expertise on working in a mobile facility. The additional surgical capacity allowed the Trust to organise its waiting lists by improving access for treatment in the specialities for which demand was the greatest. In trauma and orthopaedics, the percentage of patients treated within 18 weeks of referral increased by nearly a third. In oral surgery, patients treated within 18 weeks more than doubled. During the 23 weeks that the theatre was on site, 742 additional treatments took place.